A romantic drama film based on the bestselling book (of the same name) by John Greene. 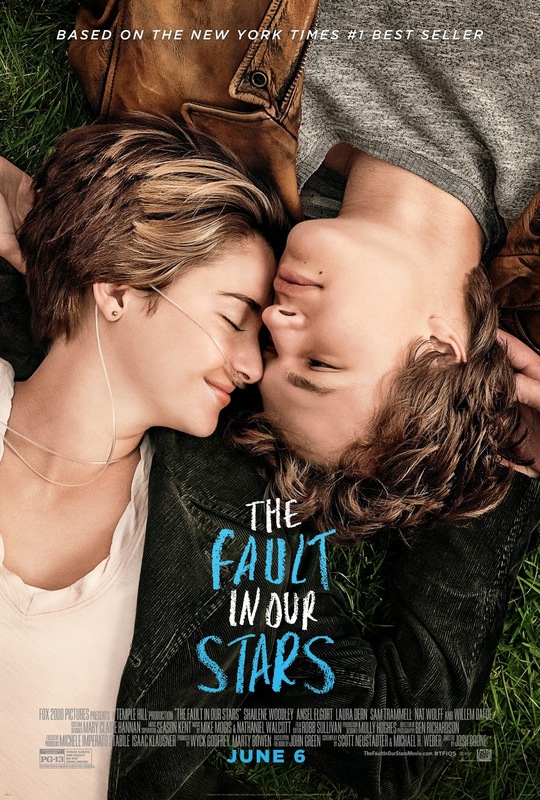 It stars Shailene Woodley as a 16-year-old cancer patient who falls in love with a cancer survivor (played by Ansel Elgort), that she meets in a support group. It was directed by Josh Boone (who also directed the 2013 romantic drama flick 'STUCK IN LOVE') and written by Scott Neustadter and Michael H. Weber (the duo also wrote '(500) DAYS OF SUMMER' and 'THE SPECTACULAR NOW', which also costarred Woodley). It costars Nat Wolff (who also costarred in 'STUCK IN LOVE'), Laura Dern, Sam Trammell and Willem Dafoe. I don't usually go for cheesy teenage melodrama or painfully bad tragic love stories but this movie isn't either of those things. It's actually a well made and moving film that offers up another stunning performance from Shailene Woodley! Woodley plays Hazel Grace Lancaster; a 16-year old cancer patient who lives in Indianapolis, Indiana with her parents (Dern and Trammell). Elgort plays Augustus Waters; a 17-year-old cancer survivor who rid himself of osteosarcoma by having one of his legs amputated. The two meet at a cancer support group that Hazel's parents force her to go to. Augustus is there to support his friend, Isaac (Wolff), who's now gotten cancer tumors in both of his eyes. Augustus immediately takes a liking to Hazel, after running into her outside of a meeting, and then proceeds to stare at her and hit on her (after the meeting concludes). The two watch a movie together (at Augustus's house) and then recommend books for each other to read. They continue to develop a relationship as Augustus tracks down the author (Dafoe) of Hazel's favorite book (a book about a cancer patient much like herself) and they attempt to get answers from him about the book's inconclusive ending. I'll start by saying I'm becoming a huge fan of Shailene Woodley. Much like her buddy (Jennifer Lawrence) I find her to be a very inspiring and likeable person (in interviews at least) and also think she's an amazingly talented actress. She's once again excellent in this film and delivers an Oscar worthy performance; she's also the main reason I wanted to see this movie. I haven't read the book and if Woodley wasn't in the movie I probably would have had no desire to see it either. I'm glad I did though and Shailene is the main reason but it's a good film in many other ways as well. Neustadter and Weber are great film writers; I love their other work (especially 'THE SPECTACULAR NOW') but they also obviously had good stories to work with (adapt). Boone is also a good director; I loved 'STUCK IN LOVE' and look forward to seeing many more movies from him in the future. The supporting cast is all decent in it as well but Elgort is especially a great match for Woodley; the two have beautiful chemistry together and they do make the story seem romantic (which is a little odd considering they played siblings in their last film, 'DIVERGENT'). The movie is touching (and funny in places) but I'm sure it's even more moving for those who can more directly relate to the subject. It deals with the issue in a seemingly effective way and never feels forced or overly done. Although the film might look (to some) like it reeks of the bad taste of similar themed movies, it doesn't. It's a well made film and another triumph for Shailene Woodley.